The world of food blogging is very picture-led these days, which is both a good thing and a bad thing. It’s a good thing because those of us so inclined can spend ages making pretty photographs with vintage props, with the excuse that we need to show, step by step, how the dish should look. It’s a bad thing because this means our guests can be left sitting at table with rumbling tummies while we fiddle with lighting and the food cools. 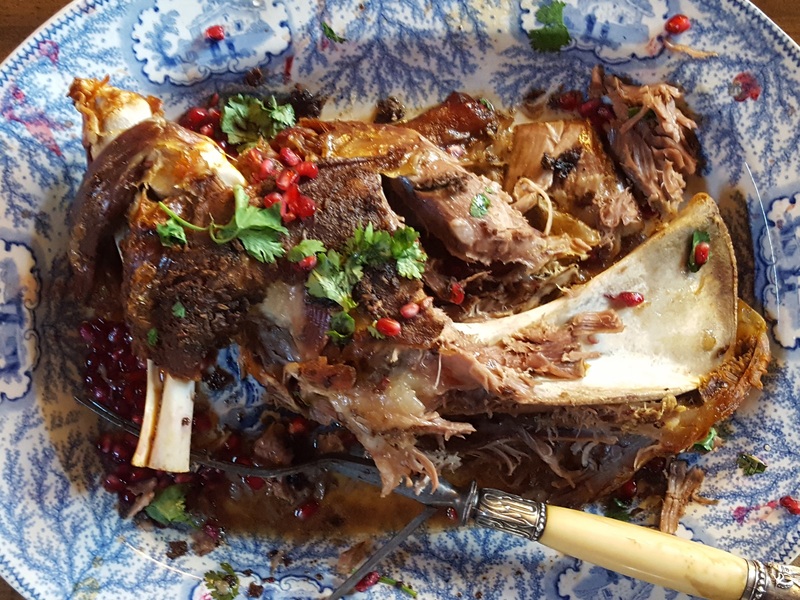 On this occasion I was so focused on feeding everyone that I almost forgot to get the camera out, so I hope you’ll take my word for it when I say this Moroccan-style slow-roast lamb is utterly delicious. We all went back for seconds and five of us pretty much devoured an entire and very sizeable shoulder. It takes a long time to cook, so set your alarm if you’re planning to serve it for lunch. Otherwise it’s trouble-free. I served it with Diana Henry’s whole roast spiced cauliflower, carrots tossed in honey and harissa, a minty yoghurt sauce and, er, roast potatoes. Feel free to use couscous instead if you’re aiming for authenticity. Mash the softened butter in a bowl with the spices, garlic, salt and pepper. Pat the meat dry with kitchen paper, make deep cuts in it with the tip of a sharp knife and rub the spiced butter over the lamb, pushing some into the slits. You can do this the night before you want to eat, if you like – just put the lamb in a roasting tin, cover and refrigerate. Bring it back to room temperature for half an hour before putting it in the oven. Six hours before you want to eat, pre-heat the oven to 150C/300F/Gas Mark 2. Pour the water into the roasting tin around the meat and tent with foil, sealing it tightly round the edges. Roast for five hours. Remove the meat from the oven, pouring off and reserving all but a cupful of the juices. Use this last cupful to baste the meat. Increase the heat to 220C/425F/Gas Mark 7 and put the lamb back in, uncovered, for 30-45 minutes until well browned. Allow to rest for 15-20 minutes before serving. Meanwhile skim the fat from the rested juices and discard. Put the sauce on the stove and simmer hard until reduced and concentrated in flavour. Check the seasoning and keep warm. Cut the pomegranate in half and, holding it over a plate, whack it with a wooden spoon until the seeds pop out. Discard any bitter membrane. Put the meat on a warmed serving dish, pour over a little of the sauce and scatter with the pomegranate seeds (plus any juice) and fresh coriander. Put the camera away and eat while hot. It will be gently spiced and falling-off-the-bone tender. 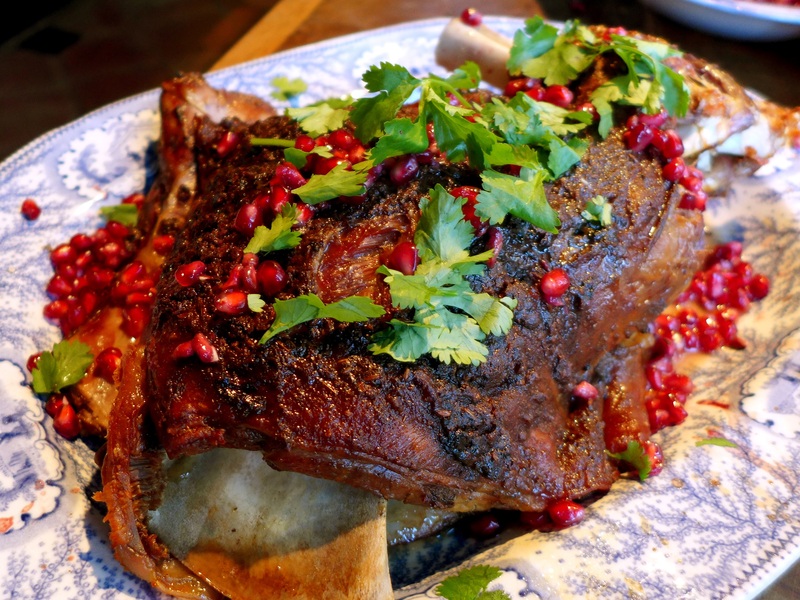 This entry was posted in Lamb and kid, Mains and tagged mechoui, slow roast lamb shoulder Moroccan style, weekend lunch by Linda Duffin. Bookmark the permalink. Ha, the photo-taking issue sounds very familiar – especially with hot, meaty main dishes you can”t just warm up again without ruining them are a nuissance these days *sigh* But! Hurried or not, your roast looks absolutely fantastic! Bless you, thanks. To be honest, I often forget to take pics when I’m cooking a big lunch, then kick myself afterwards. But good company and hot food must come first! I have been trying so hard recently to get the Moroccan spices right, Linda, but without success. This sounds like the definitive mix – and looks damn good too. Thank you.